Cristina A. Mulcahy, an associate with Modrall Sperling, has been recognized by Mayor Richard J. Berry for her assistance to a stranded wheelchair-bound woman. 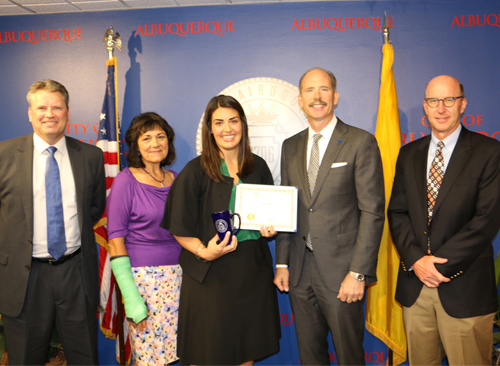 Mulcahy received the City of Albuquerque’s Good Samaritan Award for her actions. Nicole Johns had been on her way home from grocery shopping when her motorized wheelchair’s battery died, leaving her stranded. Mulcahy saw Johns, whom she described as “looking distressed.” Johns had been stranded for some time before Mulcahy drove by, noticed her, and pulled over. The situation was even worse than it first appeared. When Mulcahy stopped to offer help, she learned Johns is mute, able to communicate only with a notepad. After learning that Johns lived nearly two miles away, Mulcahy realized her initial plan to push Johns home was not feasible. Neither was loading the heavy wheelchair into her car. Mulcahy resorted to calling 911, which dispatched the Albuquerque Fire Department and Albuquerque Ambulance Services, whose unit was equipped with a wheel-chair lift. Once the emergency responders arrived, they were able to load Johns and her chair into the transport unit and take her home. All the while Mulcahy stayed on the scene with Johns.